I was writing earlier today [8 September 2016] about the Irish-born priest, Father Richard Enraght, and the Bordesley Wafer Case, in which a consecrated wafer was stolen at the Eucharist by one of his churchwardens, John Perkins, and used in his zealous prosecution by the Church Association. The stolen host was produced in court at his trial as evidence, marked with pen and ink and filed as an exhibit. Eventually, through the efforts of the English Church Union, the Consecrated Wafer was obtained from the court and given over to the care of the Archbishop of Canterbury, who reverently consumed it in his private chapel at Addington on 12 December 1879. In a comment, my friend the Redemptorist theologian Brendan McConvery, editor of Reality, was particularly struck by this detail. But, of course, the outrage caused by the churchwarden and the subsequent action of the Archbishop of Canterbury were based not solely on Anglo-Catholic practices but on the traditional Anglican attitude to disposing of the consecrated elements after the Eucharist or Holy Communion. I was shocked some years ago, after a very large service, to see the left-over consecrated wine being poured into the ground in the churchyard outside. Some colleagues report that it is becoming more-and-more a frequent occurrence to see the consecrated wine left over being poured down the sink. Some suggest that this practice is a statement by evangelicals that they do not believe in the real presence. Other priests pour it back into the bottle. They may think they are being thrifty but it is unhygienic: the germs that have left in the chalice can now grow and thrive in the alcohol in the bottle for the next week or more. Anglicans have a number of divergent and sometimes overlapping views about the presence of Christ’s body and blood in the bread and wine of the Eucharist. But whatever an individual’s theological views may be, the consecration sets apart the elements of bread and wine from common and profane use and so calls for reverent care of the sacrament. As early as the third century, Tertullian said: ‘We feel pained should any wine or bread, even though our own, be cast upon the ground’ (De corona 3). Successive liturgies of the Church of England has insisted that the consecrated elements left over be reverently consumed. The first Book of Common Prayer in 1549 provides no instructions on what to do with any remaining sacramental elements. Until then, clergy who had used the Latin Mass, were used to consuming the elements, washing the sacred vessels with water, and reverently consuming the water used to rinse them. And to take awaye the superstition, whiche any person hath, or myghte have in the breade and wyne, it shall suffice that the breade be suche as is usual to be eaten at the table, with other meates, but the beste and purest wheate breade, that conveniently may be gotten. And yf anye of the breade or wyne remaine, the Curate shall have it to hys owne use. And if any of the Bread and Wine remain unconsecrated, the Curate shall have it to his own use: but if any remain of that which was consecrated, it shall not be carried out of the Church, but the Priest, and such other of the Communicants as he shall then call unto him, shall, immediately after the Blessing, reverently eat and drink the same. It could be argued that in the 1662 rite, the Eucharistic action continues after the communion of the people, and that the Prayer of Oblation is originally part of the Prayer of Consecration, so any ablutions before the blessing would be premature. 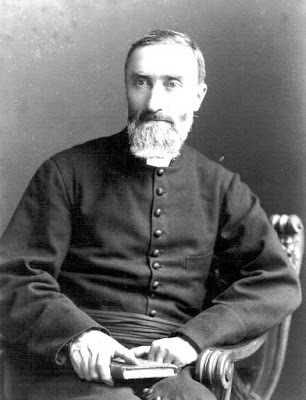 If there be any persons who through sickness or any other urgent cause are under a Necessity of communicating at their houses, then the Priest shall reserve at the open Communion so much of the Sacrament of the Body and Blood, as shall serve those who are to receive at home. And if after that, or if, when none are to communicate at their houses, any of the consecrated Elements remain, then it shall not be carried out of the Church; but the Priest, and such other of the Communicants as he shall then call unto him, shall immediately after the Blessing reverently eat and drink the same. Any consecrated bread and wine which is not required for purposes of communion is consumed at the end of the distribution or after the service. (e) The bread to be used shall be the best and purest bread that can be obtained. Care is to be taken that the wine is fit for use. (f) After the communion the vessels shall be carefully and thoroughly cleansed with water. Direction (e), in my opinion, does not favour the use of sliced pan but does allow wafers. Indeed, I enjoy shopping for ‘the best and purest bread that can be obtained.’ Nor does the spirit of direction (e) allow for wine to be poured back into a bottle in the vestry afterwards. There are different views on what ‘reverently’ means, so that some regard it as appropriate to give bread to the birds and to pour wine into the ground, ‘returning the elements to nature.’ But the word ‘consumed’ does not allow this interpretation, and any appeal to the course of nature is also unconvincing. All God’s good gifts of food and drink are subject to the same physical process. But that is no excuse for treating the consecrated sacrament as refuse or waste material. And certainly this is not the understanding of the word ‘consumed’ in plain English. Others see the consumption of what remains as the most appropriate form of reverence. But I have heard people claim that the public consumption of the remaining elements is indiscreet or offensive. They say, for example, that the washing-up does not usually take place at a dinner table in front of the guests. 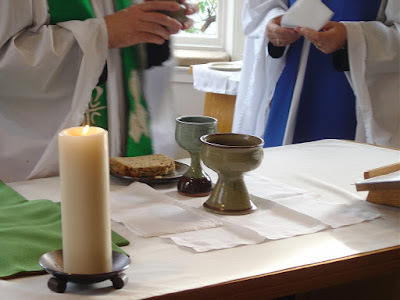 Canon Law in the Church of England today says no portion of the bread and wine consecrated at the Eucharist shall be carried out of the church in accordance with the provisions of Canon B 37 (2) except at the express wish of an individual sick communicant. In such cases, this shall be done either during or immediately after the service, or as soon as practicable on the same day. What is known as ‘tarp-ing’ or ‘taking the ablutions in the right place’ – immediately after the Communion – was encouraged by Anglo-Catholics. This had been the Roman Catholic practice since the 16th century, but it also shortened the length of time during which the celebrant kept thumb and forefinger joined for fear of dropping consecrated particles. ‘Taking the ablutions in the right place’ is also a public witness to belief in the real presence, however that may be understood. From a practical point of view, it allows me time to greet people on their way out of the church or the cathedral. Last week, while I was staying in Sidney Sussex College, Cambridge, I wrote [31 August 2016] about the Revd Thomas Pelham Dale (1821-1892), a pioneering 19th century Anglo-Catholic who had been a Fellow of Sidney Sussex and was who was jailed for his ‘ritualistic’ high church practices. The Revd Richard William Enraght (1837-1898) was an Irish-born Anglican priest and one of the Anglo-Catholic priests who were prosecuted and jailed in the 19th century for their ritualism. Like Thomas Pelham Dale, Richard Enraght was prosecuted by the Church Association’s lawyers and jailed by Lord Penzance. He refused to attend his own trial on grounds of conscience, was found guilty under the Public Worship Regulation Act and received the maximum penalty: arrest, imprisonment and dismissal from his parish. Enraght was born on 23 February 1837 at Moneymore, Co Derry, where his father, the Revd Matthew Enraght (1805-1882), was the Curate of Saint John’s, Desertlynn. Matthew Enraght was born in Limerick, while Richard’s mother Sarah was the daughter of Henry Thomas Houghton of Kilmanock House, Arthurstown, Co Wexford. 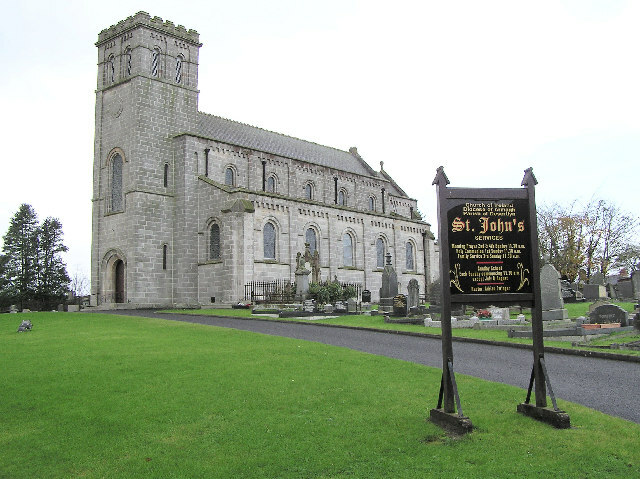 Soon after Richard’s birth, Matthew Enraght moved from the Diocese of Armagh to Dublin, where he became the curate of Donnybrook and Booterstown. Richard’s mother died while he was still an infant, and his father married Maria Massey in 1843. When Matthew Enraght later moved to England, to parishes in the dioceses of Canterbury and Chichester, Richard remained in Ireland and in 1860, at the age of 23, he graduated BA from Trinity College Dublin. He then moved to England, and in 1861 he was ordained deacon in Gloucester Cathedral by the Bishop of Gloucester and Bristol. He became a curate at Saint Bartholomew’s in Corsham, Wiltshire, and was ordained priest in 1862. After three years, Enraght moved to Saint Luke the Evangelist in Sheffield in 1864. There he showed his Anglo-Catholic sympathies in a pamphlet, To The Poor The Gospel is Preached, in which he criticised the pew rent system for barring the poor from churches and criticised a ‘Bible-Ritualism’ that over-relied on scriptural authority for what is permissible in liturgical ceremonial. He moved to a parish in Lincolnshire for a year in 1866, and then in 1867, he moved to Brighton as curate to the Revd Arthur Wagner, the Tractarian vicar of Saint Paul’s and the ‘Father’ of the Catholic Revival in Brighton. Wagner held Tractarian views since his student days at Cambridge. He built churches and schools in Brighton and also built 400 houses for the poor, all at his own expense. But he was criticised in the House of Commons for his liturgical practices and for appointing Anglo-Catholic priests as vicars in the five churches he had financed. In 1873, the Brighton Gazette reported that Father Wagner had refused to answer questions in court that would ‘involve him to breach the confessional.’ Following this report, Wagner was assaulted on the streets of Brighton. At another Brighton parish, Father John Purchas of Saint James’s was prosecuted for using vestments and the eastward position, but he refused to attend his trial or to pay the costs of £2,096 the court awarded against him. At Brighton, Enraght shared his Anglo-Catholic views in two pamphlets, Who are True Churchmen and Who are Conspirators? and The Last Settlement of English Reformation in 1662. In 1871, Enraght was appointed priest-in-charge of Saint Andrew’s Church, Portslade-by-Sea, with Saint Helen’s Church, Hangleton. Portslade was just three miles from Brighton and Enraght was able to continue his role in the Brighton branch of the Society of the Holy Cross, to publish pamphlets and to write letters to the Brighton Gazette. His pamphlets there included Catholic Worship and The Real Presence and Holy Scripture. The Brighton Gazette accused Enraght of Puseyism and of trying to turn Saint Nicholas Church School in Portslade into a Puseyite school, and attacked his plans for a retreat at Lancing College. When the Disraeli Government passed the Public Worship Regulation Act in 1874, the Brighton Gazette called for his prosecution. Later that year, Enraght moved to Birmingham as Vicar of Holy Trinity, Bordesley, where he succeeded the Rev Dr Joseph Oldknow, Birmingham’s first Anglo-Catholic priest, and he found friends in two neighbouring Irish-born priests in the Anglo-Catholic tradition, the brothers James and Thomas Pollock, both graduates of TCD and both priests at Saint Alban the Martyr in Highgate. An indication of Enraght’s popularity was the attendance at the Sunday Eucharist, with a congregation of between 400 and 500. The Sunday Evensong with sermon regularly attracted 700 to 800 people. With his parish’s support, Enraght introduced weekday celebrations of the Eucharist. His practices at Holy Trinity included the adoration of the Blessed Sacrament, candles on the altar, wearing a chasuble and alb, using wafers at the Eucharst, mixing water with the wine, making the sign of the Cross, bowing during the Gloria, and allowing the choir to sing the Agnus Dei. On 9 February 1879, one of Enraght’s churchwardens, John Perkins, came forward for Holy Communion but took a Consecrated Wafer to use as an exhibit in court as evidence of the use of wafer-bread. The incident created intense horror and indignation as it became known. In his absence, Enraght was convicted on 9 August 1879 on 16 counts. On 31 August 1879, he denounced Perkins from the altar. At the next vestry election, the indignant parishioners rejected Perkins when he was nominated as churchwarden. Eventually, Enraght was arrested at his vicarage on 27 November 1880 and he was taken to Warwick Prison to serve his sentence. 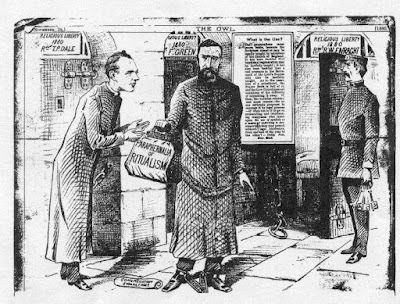 Four other priests in England were jailed around the same time under this legislation: Arthur Tooth, Thomas Pelham Dale, Sidney Faithorn Green and James Bell Cox. Meanwhile, thanks to the English Church Union, the Consecrated Wafer was recovered from the court and given into the care of the Archbishop of Canterbury, who reverently consumed the host in his private chapel at Addington on 12 December 1879. Enraght spent that Christmas in prison. He was released after 49 days when the Court of Appeal ruled on a technicality in the writ for committal. The prosecutor tried to have Enraght returned to jail, but the English Church Union forestalled this attempt with its own legal actions. When an appeal to the House of Lords failed in May 1882, Enraght was liable to another term in prison, and the parish of Holy Trinity, Bordesley, was declared vacant three months later. Meanwhile, Enraght’s father, the Revd Matthew Enraght, died at Clifton in Bristol on 13 August 1882. However, a Royal Commission report that year marked a turning point, and the repression of ritualism in the Church of England was soon abandoned. 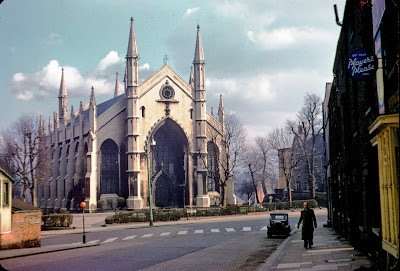 After Enraght was evicted from Holy Trinity, Bordesley, he worked for the next nine years in East London at Saint Michael’s, Bromley-by-Bow (1884-1888) and Saint Gabriel’s, Poplar (1888-1895). In this period of hardship, the Church Union’s Sustentation Fund supported the Enraght family. In 1895, he was presented to Saint Swithun’s Church, Bintree, and he ended his ministry and life in that quiet country parish in Norfolk. He died on Saint Matthew’s Day, 21 September 1898, and was buried at the south-east end of Saint Swithun’s churchyard, Bintree. Richard and Dorothea Enright were the parents of seven children. Their second son, Canon Hawtrey Enraght, was ordained priest in Norfolk in 1896, and their son-in-law, the Revd Edgar Reeves, became the Vicar of Walsingham. Ten years ago, in February 2006, Brighton and Hove City Council erected a blue plaque at his former home in Station Road, Portslade, to honour Richard Enraght as a ‘Priest, fighter for religious freedom.’ Later that year, Brighton and Hove Bus and Coach Company named one of its new fleet buses, No 905, after Father Richard Enraght. Holy Trinity Church in Bordesley has long been closed, and the building was sold by the Diocese of Birmingham.